It is said that the Wheatstone bridge was invented by Sir Charles Wheatstone. But the first illustration about the bridge was provided by Samuel Hunter Christie. He designed the bridge to compare the electromagnetic forces in different metals. He proposed the bridge to measure the unknown resistance which are connected in electrical circuits. The bridge worked due to the diamond shaped arrangement with four resistors. Thus, he called the Method as the Diamond Method. Samuel Hunter Christie then mentioned about the method in the paper which described about the electromagnetic conductivity of different metals. In the paper he mentioned that the conductivity of various wires depends upon the diameter of the wire and the length of the wire. Fortunately the paper was chosen. But the council was focused on the electromagnetic investigation. The diamond method he founded was not taken into account much. Thus initially this method was not known much among the people. Later after some years Sir Charles Wheatstone proposed the bridge in another paper. He then proposed the device for calculating the resistance in the circuit. However Charles Wheatstone publicly admitted that the bridge was not his invention. He gave the full credit of this invention to Samuel Hunter Christie. As it was Charles Wheatstone who brought the attention about the device, it was called as Wheatstone Bridge. Wheatstone called it as the differential resistance measurer. Sir Charles Wheatstone developed rheostat. Rheostat is used to control the electric current flow by adjusting the resistance. Thus he upgraded the design of the bridge by adding rheostat and variable resistor. Other scientists like William Thomson, James Clerk Maxwell, and Lord Kelvin have also helped in developing the Wheatstone bridge. Charles Wheatstone used the Wheatstone bridge in telegraphy to find the value of resistance of telegraph wires and coils. 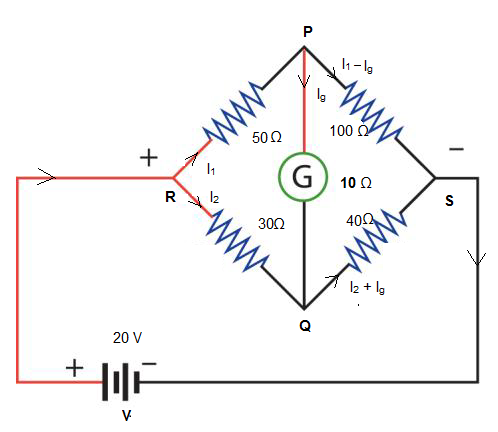 Wheatstone bridge is used to measure the unknown resistance connected in a circuit. It consists of four resistors of which two resistors are known resistors, one variable resistor and one unknown resistor. It also consists of a galvanometer. It consists of two series-parallel arrangements of resistors. Consider the diagram of Wheatstone bridge given below. It consists of four arms PQ, QR, RS and PS which has fixed and variable resistors. Resistors resists the flow of electric current. Its measure is called Resistance. Here R1 and R2 are the fixed resistors and R3 is the variable resistor and Rx is the unknown resistor. The resistor which restricts and also can control the flow of electric current is called Variable Resistor. It can either increase or decrease the resistance value and thus control the flow of current. The arms PQ and QR are known as Ratio Arms. We can see that a galvanometer is connected between the terminals Q and S. Q and S is called the galvanometer arm. Also the battery is connected to the other two terminals P and R. P and R is called the Battery Arm. By adjusting the value of variable resistor we need to make the deflection in galvanometer as null. The bridge is said to be balanced when there is no current flowing through the galvanometer. This means that the potential difference or voltage between the points Q and S is zero. In this case the current flowing through the fixed resistors R1 and R2 is the same and is considered as I1. The current flowing through the variable resistor R3 and the unknown resistor Rx will be the same and is I2. As the potential at Q and S is the same, the voltage drop from the point P to Q is equal to the voltage drop at from point P to point S.
I1 R1 = I2 R3 / I1 R2 = I2 RX. Thus R1 / R2 = R3 / Rx. Thus Rx = R2 R3 / R1. The unknown resistance is determined in terms of other known resistors in the bridge. R1 / R2 = R3 / Rx. The value of the unknown resistance can be found in other ways too. Consider the same figure given above. When Ig, the current through the galvanometer is zero the bridge is said to be balanced. Apply Kirchhoff’s loop rule to the closed loops PSQP and RQSR. Kirchhoff’s loop rule or voltage law states that the sum of voltage drops is equal to the sum of voltage rise. The algebraic sum of all voltages across the circuit will be zero. Consider the first loop PSQP. From the first loop we get, I2 / I1 = R1 / R3. Also from the second loop we get I2 / I1 = R2 / Rx. Thus R1 / R3 = R2 / Rx, Rx = R2 R3 / R1. Consider the same figure. By adjusting the variable resistor the bridge is balanced as usual. 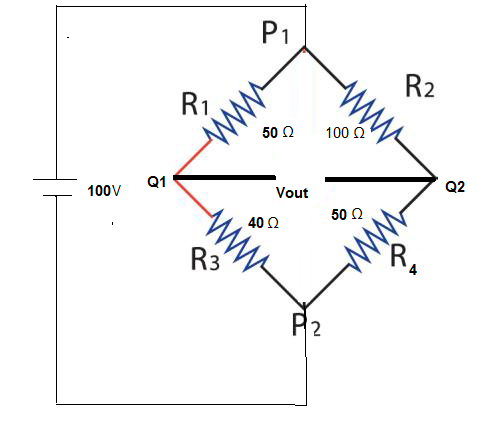 Also the voltage at points Q and S should be equal for the bridge to be balanced. This method is applying the ohms’ law. Problem: Calculate the voltage across the points P and R. Also find the value of resistor R4 to balance the bridge. Thus Vout = 44 – 33 = 11 V.
With the help of Wheatstone bridge, we can have a light detector circuit. Bridge circuits are used to measure intensity of light. A light dependent resistor is a device which uses the variations in the intensity of light into the change in voltage and resistance. In the bridge circuit one of the resistor is replaced by LDR. Thus. We can monitor and measure the deviation in the levels of light. The other applications of the bridge circuit include to measure the changes in pressure. They include strain gauge, thermistor, potentiometer etc. The Wheatstone bridge is used with operational amplifier and it can measure and amplify the small changes that takes place in resistors. The bridge circuit is used in transducers and sensors in industries. Other than the resistance, it is also possible to measure the capacitance, inductance and impedance of a circuit. One of the important application of the Wheatstone bridge includes the strain gauge. It is the instrument used to measure the strain. Strain is the amount of change a material undergoes when an external force is applied. When a metal conductor is stretched, or compressed, the resistance of the material changes as the length, diameter and the resistivity of the material changes. The resistance changes to a very small value for a particular strain. So, to measure such small resistance changes and for better accuracy we used the Wheatstone bridge. In this case, we replace the unknown resistance with a strain gauge. Consider the bridge circuit given below. Here two resistors R1 and R3 have equal resistance. R2 is the variable resistor. R1 and R3 is one voltage divider circuit and R2 and RS makes the other voltage divider circuit. We know that the series circuit act as the voltage divider circuit. This means that the voltage across each resistor in a series connection will be different. When no force is applied to the strain gauge, the variable resistor is varied to obtain the zero deflection in the voltmeter. This is the balanced circuit. Thus we get R1 / R3 = R2 / RS when VOUT  = 0. Any change in the resistance of any arm produces an output voltage other than zero. When the strain gauge is compressed or tensed the resistance increases or decreases. 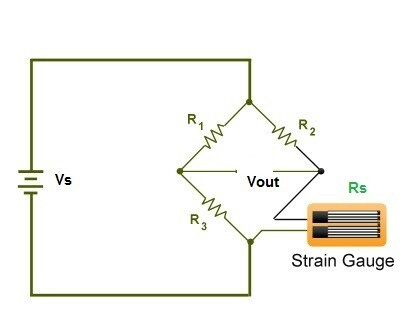 That is any change in the resistance of the strain gauge makes the bridge unbalanced and produces an output voltage which is a non-zero value. We get the value of the change in voltage by the voltmeter connected in the circuit. This value will be the function of strain. It is not used to measure very large resistance as the galvanometer becomes insensitive in such cases. Very high currents produce heat and can damage the resistors. The cost is also high as the resistors we use should have high tolerance. Samuel Hunter Christie introduced the diamond method to compare the electromagnetic forces in different metals and to measure the unknown resistance in an electrical circuit. Initially this method did not become much popular among the people. Sir Charles Wheatstone proposed the bridge. As he brought the attention about the device, it was called as Wheatstone Bridge. However, Charles Wheatstone publicly admitted that the bridge was the invention of Samuel Hunter Christie. Wheatstone bridge consists of four resistors of where two resistors are known resistors, one variable resistor, one unknown resistor and a galvanometer. The applications of the Wheatstone bridge include strain gauge, thermistor, potentiometer, light detector etc. The Wheatstone cannot be used to measure very large resistance.